Intel hopes a new mini-computer the size of an SD card will drive growth for it in the wearables market. 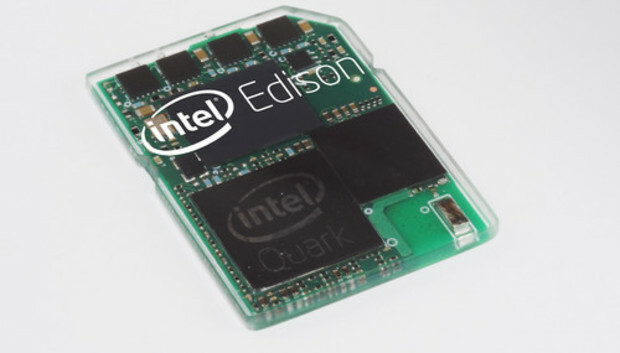 Edison is Intel's smallest computer yet, and is intended for use in small, flexible electronics that can be worn around the body. The computer has Intel's extremely low-power Quark processor, and Bluetooth and Wi-Fi wireless connectivity to communicate with other devices. Intel wants to put Edison in wearable products beyond the regular realm of smartwatches, smart glasses and health monitors expected to swamp the International CES trade show being held this week in Las Vegas. Wearable technology isn't just about having a camera on your hand; it needs to be natural and chips need to be invisible, said Mike Bell, vice president and general manager of the New Devices Group at Intel, in an interview. Intel will demonstrate the chip in baby garments that are part of Rest Devices' Mimo Baby product line. Edison will be able to track an infant's heart rate, temperature, activity level and body position. The chip can do all calculations locally, and transfer data wirelessly to other connected devices like smartphones. Edison will also be demonstrated in Rest Devices' smart bottle warmer, which will be able to measure liquid consumption by a baby. Putting the Edison chip in the Rest Devices' products was painless, and as simple as swapping out chips, Bell said. "We're trying to show how this technology enables products that would have been difficult to produce in the past," Bell said. Edison is based on the x86 architecture and will be made using the latest 22-nanometer process. It runs a version of Linux and is fully "synthesizable," Bell said, indicating that the chip can be easily reprogrammed to adapt to different types of wearable use. Intel's ability to develop power-efficient processors should not be doubted, he said, pointing to a demonstration of a single glass of wine powering a chip at last year's Intel Developer Forum. The same group behind that demonstration has developed Edison, Bell said. Edison is different from its larger US$70 Galileo open-source computer, which is targeted at enthusiasts making computing devices ranging from robots and health monitors to home media centers and PCs. Galileo has a 32-bit Quark SoC X1000 CPU, which runs at a clock speed of 400MHz, and also supports general computing interfaces like PCI-Express, Ethernet and USB 2.0. Galileo also supports the Arduino development environment, which is widely used in the maker community. Edison has low-power DDR2 memory, minimal interface support, and does not support Arduino out of the box. But an expansion card will bring support for the development environment, Bell said. The chip will be made available to the do-it-yourself and maker community around the summer, which would be around June or July. Intel did not share the price of the product. Intel is also developing chips that are smaller and more power-efficient than Edison, and Bell did not discount the possibility of flexible chips for wearable devices in the future. "I think we have the technology we need to provide mind-blowing stuff," Bell said.